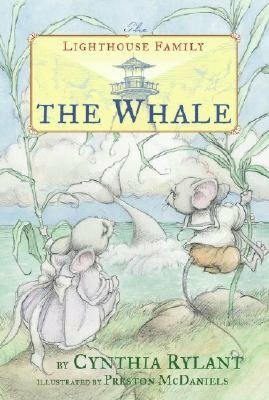 We read The Whale in two days. In this story, mice siblings Whistler and his sister Lila, hear a cry for help down by the seashore. They rush to see who is in trouble and discover a baby beluga whale who has been sadly separated from his mother. Whistler and Lila promise to help reunite the young one to his mother and set about doing so. This series of books is illustrated by Preston McDaniels and again I was impressed by how home-like he makes the lighthouse. He provides warmth and depth of character for each of the animals. Whistler and Lila are quite the cuddly little mice. Rylant's writing is enjoyed in it's entirely and she never fails to make Bookworm1 laugh out loud at least once during these "Beginner Chapter Books." It should be pointed out that these are truly beginner chapter books. Each chapter is short and reasonably illustrated. Even if Bookworm1 were still 4, I firmly believe we could have sat down and enjoyed these books immensely. At 5 we're having to pace ourselves or else we discover that we can easily consume one of these books each day. In fact, we did consume the next book in the series, The Turtle , in one evening. It probably took us less than an hour to read, as this particular book only has four chapters. Given the fact that this book is shorter, there are illustrations on every page. (In the other titles there have been illustrations on every other page.) Also, it's probably a good thing to note that while we read the books in order, they do not have to be read that way. The beginning chapter of each title offers an explanation of The Lighthouse Family so you aren't missing out on anything by reading them improperly in whatever order you like. 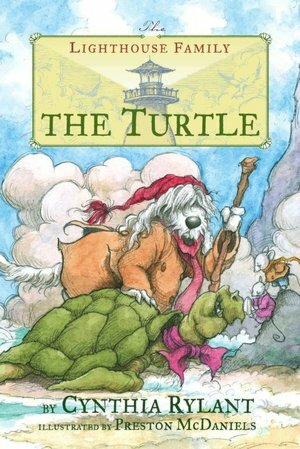 If you have a really-new-to-chapter-books-reader, you may want to consider reading The Turtle first as it is much shorter than the two which come before it. In The Turtle we find the Lighthouse family standing guard over the coastline in some pretty foggy and windy weather. Seabold (the dog) and Whistler and Lily (the mice) are out sounding the fog horn to warn schooers away from the rocky shoreline when they heard another (you guessed it!) cry for help. This time they discovered a one hundred year sea turtle who had washed ashore. Using a great deal of team work, and calling on some help from a pod of pelicans, they return the sea turtle to her ocean home. All in a good day's work for The Lighthouse Family. These are short and simply stories but are heartily enjoyed by Bookworm1. We recommend them and will continue reading on. Thanks for the reminder (again!) about this series! I shall look for them on my next library run for my K-er to read to/with me! Cynthia Rylant offers such great books...thanks for this reminder! Well, you've convinced me to add these to our shelves. I'm going to keep an eye out for them, since we still have a little while before I could read them to Grasshopper. Thank you for sharing. I just put the first two on hold at the library. I am making a list of potential read-alouds. We really like the Mercy Watson books by Kate DiCamillo (minus the Halloween one). I'm glad you linked up another of these books. I made sure and put them on the wishlist for my kindergartener because she will love these!